General Awareness is a source for good preparation of Bank, SSC CGL, UPSC, and railway and for other competitive exams. Study General Awareness from www.GovtJobsPortal.in and stay updated as well as prepare for General Awareness section which is asked in SSC CGL, UPSC and other competitive exams. Here we are providing static GK for SSC CGL exam. 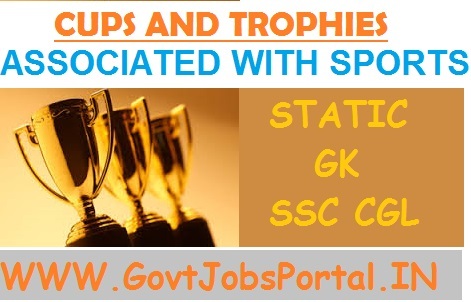 Today’s topic on static GK is CUPS AND TROPHIES FOR SPORTS. In this topic we are providing information about Cups, trophies and awards for sports in the world. The international trophies and awards are various types for various types of sports. These cups and tropics are conferred to sports person for showing distinguished work in their particular sport or game. It will be helpful for General Awareness section in SSC CGL exam.